With Thanksgiving around the corner I am adding fresh pumpkin purée to everything. The best thing about making your own pumpkin purée: a built in sensory activity! Pumpkins are literally filled with Sensory fun. Get little hands on pumpkin guts and seeds to promote exploration and encourage children to use scientific processes while they play, create, investigate and explore! My kids love to help me scoop out the pumpkin insides and separate the seeds from the guts. We use colanders, plastic containers, bowls and spoons for manipulating the pumpkin insides. We separate the seeds from the guts, usually only to mix it all back together and start again. My oldest helps me wash and sort through seeds while the younger two enjoy mushing and squishing the guts. If you want to enjoy some fresh pumpkin snacks I suggest cooking the seeds and making purée. For the pumpkin seeds, I like to boil them in water (with 1 tablespoon salt) for about 10 minutes before baking. 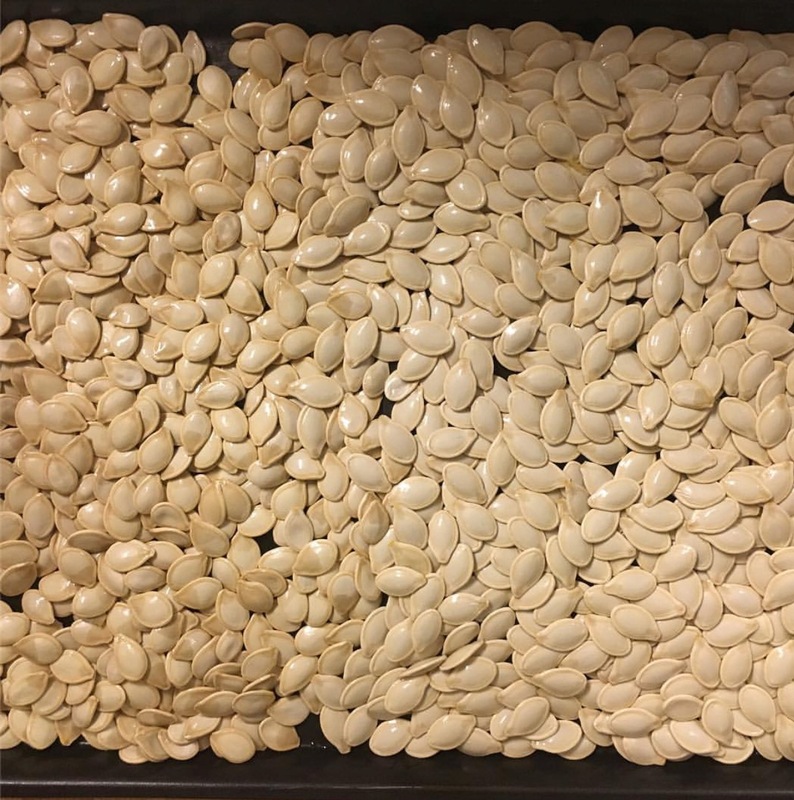 After boiling, strain the seeds, toss with a little olive oil and salt, spread out on a baking sheet and bake until crispy (about 30 minutes at 350 degrees F.) This year I also made cinnamon sugar pumpkin seeds. After boiling the seeds I tossed the seeds with melted butter and cinnamon sugar mixture. I repeated this 3 times during the baking to ensure maximum cinnamon sugar goodness! If you want pumpkin purée for making pies, muffins, breads and granola, bake the pumpkin pieces cut side down on an oiled or lined pan until fork tender. While still warm scoop the pumpkin “meat” out of the skin and blend until smooth. Once cooled, you can refrigerate or freeze.